Tunnel plant are considered the most traditional washing/chemical treatment systems. These are particularly suitable for cleaning and chemical treatment of parts with simple shapes and a smooth surface without the critical cracks. 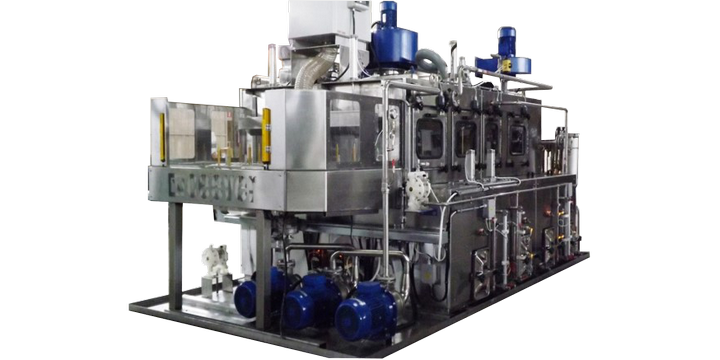 These machines are often used in the production lines of mechanical, automotive and aerospace companies for inter-process cleaning or for precision cleaning before assembling. Due to their flexibility, tunnel equipments can be used for big and small productions. Projected to exclusively operate with water based detergent, they found their effectiveness on the chemical action, thermal and mechanics, guaranteeing effectiveness and good results to the process Tunnel plant are considered the most traditional washing/chemical treatment systems. The working principle is based on the linear movement of the parts through the various phases of the process with continuous motion or by stopping positioned in accordance with the nozzle for precise local treatments. While this movement every nook and cranny of the treated parts is penetrated with the hot cleaning solution under high pressure, capable to eliminate all traces of impurities and dirt.